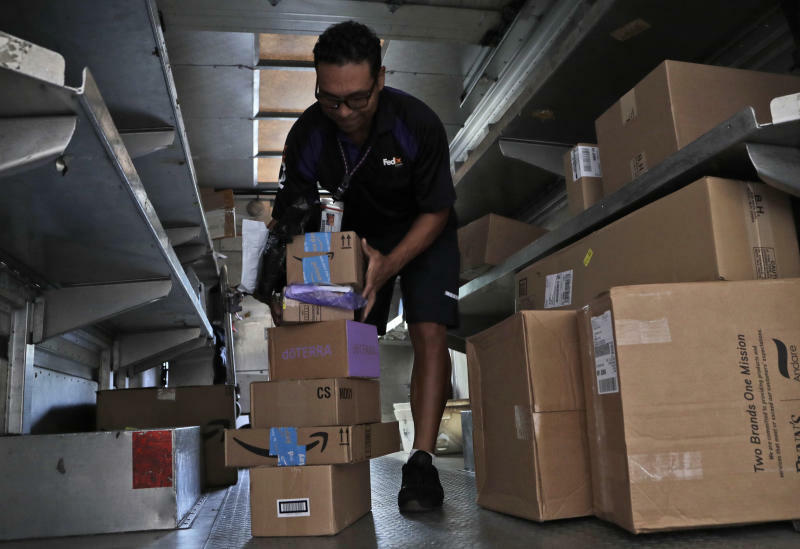 MEMPHIS, Tenn. (AP) -- FedEx Corp. reported lower profit Tuesday as its ground-shipping unit struggled with higher costs, and the company cut its forecast of full-year earnings. Its shares fell more than 5 percent in after-hours trading. "Our third quarter financial results were below our expectations and we are focused on initiatives to improve our performance," Chairman and CEO Fred Smith said in a statement. Investments in innovation, infrastructure and automation will help boost earnings in the long run, he said. FedEx's ground-shipping business took in 9 percent more revenue than a year earlier, but operating income fell by 6 percent due to higher costs for running six days a week year-round and buying transportation capacity. Until January, the company ran six days a week only around the peak holiday shipping season. Daniel Sherman, an analyst with Edward Jones, said the two items that stood out in the quarter were lower profit in FedEx's ground segment and weak revenue in its key express unit due to sluggish economic conditions in Europe and changes in the mix of goods shipped in the U.S.
"It has more residential (deliveries) in it, they're going shorter distances, and they are lighter-weight packages," Sherman said in an interview. FedEx is making major investments — technology upgrades, new hubs in Memphis and Indianapolis, and integrating the Dutch delivery firm TNT into FedEx, Sherman noted. The 2016 acquisition of TNT has been plagued by high integration costs and a damaging cyberattack. Sherman said he believes the deal will pay off, "it's just going to take a while." Memphis, Tennessee-based FedEx said it earned $739 million in its fiscal third quarter, which ended in February, down from $2.07 billion a year earlier, when profit was helped by a one-time gain in deferred tax liability from tax cuts. The adjusted profit was $3.03 per share. Wall Street was expecting $3.08 a share, according to FactSet. Revenue rose 3 percent to $17.01 billion. FedEx cut its full-year earnings forecast for a second time, to between $11.95 and $13.10 per share, down from $12.65 to $13.40. The company originally predicted earnings between $15.85 and $16.45 for the fiscal year that ends in May. Shares of FedEx dipped 99 cents to close Tuesday at $181.41 before the release of the earnings report. They dropped $10.31, or 5.7 percent, to $171.10 in extended trading. FedEx Corporation (NYSE:FDX): Immense Growth Potential?